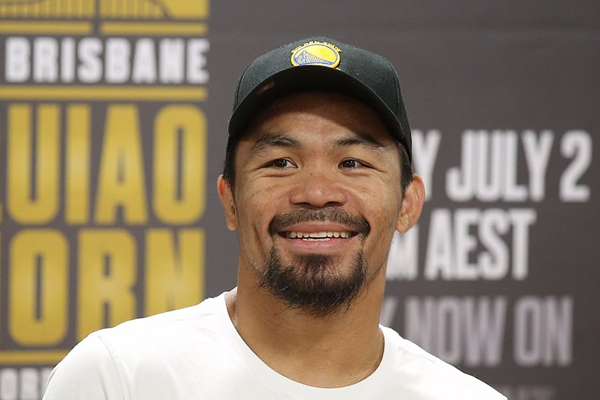 Manny Pacquiao is one of the two biggest boxing stars of this century. He is a genuine, four-division world champion and has won major fights against opponents from 112 to 150 pounds. In short, he is an all-time, pound-for-pound elite. Even at 38, his status in the sport remains high. Last year he defeated Timothy Bradley and Jessie Vargas with ease. Those two wins and his resume are enough for me to rank him at the top of the welterweight division. With Roman Gonzalez and Sergey Kovalev taking losses in their most recent fights, I am even left placing Pacquiao at No. 2 in the pound-for-pound rankings, behind only Andre Ward. The wins over Bradley and Vargas are as good as any by Gennady Golovkin or Terence Crawford, and Crawford and Golovkin don’t have wins over legends. Pacquiao has more than half a dozen. But Pacquiao returns to action this weekend and it’s hard to care. He’ll be fighting Jeff Horn, a little-known opponent with record of just 16-0-1 and not a single significant win on his resume. The best victory on Horn’s record is his April 2016 of over-40 Randall Bailey. It’s been a solid decade since a win over Bailey really meant anything. It’s a stretch to call Horn a contender. So why is an unheralded, un-tested prospect like Horn fighting a superstar like Pacquiao? Because it will sell a lot of tickets in Australia? I can’t think of any other good reason. In the United States, the bout with be carried on ESPN. It’s worth watching, if it’s free, for no other reason that it is Pacquiao. But it is a far fall for the Filipino superstar. He lost a large portion of his American fan base when he made a poor showing against Floyd Mayweather in 2015 and then made questionable injury excuses. He lost his support with the Hollywood set when he made hostile and degrading comments about homosexuals. Make no mistake, he will beat Horn–even if he is 80 percent of what he was against Vargas and Bradley last year. And five years after hanging up the gloves, he will be a universal pick for the Hall of Fame. He might even have at least one more mega-fight performance in him. Time will tell. But for now, he is further from the boxing spotlight than he has been since starching Marco Antonio Barrera way back in 2003.